June 3, 2013 by David Shields. Average Reading Time: about 6 minutes. Rob Roy Kelly’s seminal American Wood Type 1828–19001 focuses solely on the nineteenth century. Other than a sidelong reference to Allied Wood Type Mfg Co in incorrectly attributed images on pages 160 and 161 and a passing reference to the American Wood Type Mfg Co on pages 62 and 161, Kelly leaves the 20th century unexamined. The research work I have undertaken aims to fill in these blanks and the process so far has uncovered 8 American wood type manufacturers working in the 20th century. I have begun slowly piecing together their histories. I first became aware of the ACME Wood Type & Manufacturing Co in the spring of 2010 through email correspondence with Jim Thompson of the International Printing Museum in California. The museum houses a range of Gothic faces, in varying sizes with the ACME manufacturer’s stamp. ACME is not mentioned by Kelly in American Wood Type, and I hadn’t run across specimens books or references to the company in any of my research up to that point. 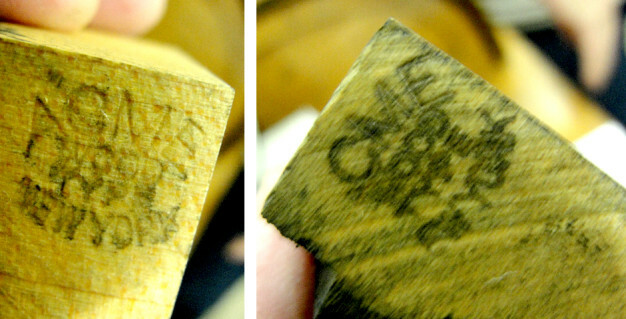 While many wood type companies in the 20th century were simply distributors for Hamilton Mfg Co of Two Rivers, Wisconsin or American Wood Type Mfg Co of New York City, ACME appeared to be an independent manufacturer, most notably because of the use of their own manufacturer’s stamp on the side of the capital “A”. After meeting Jim and seeing the type blocks in person on a trip that following summer to California, I began trying to track down references to the manufacturer. 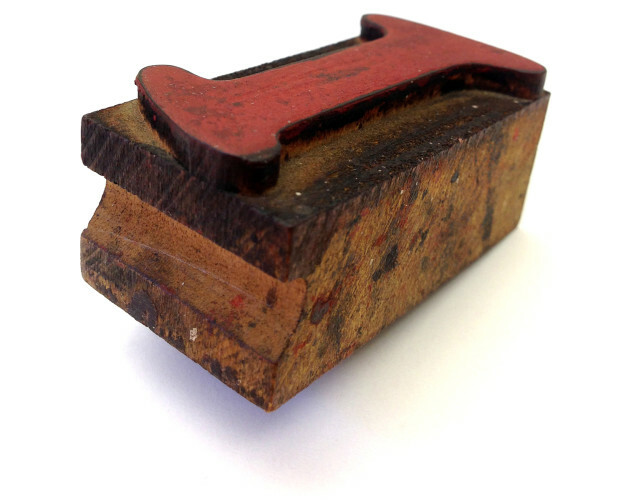 The manufacturer’s stamp made it apparent that the company was based in New York City. 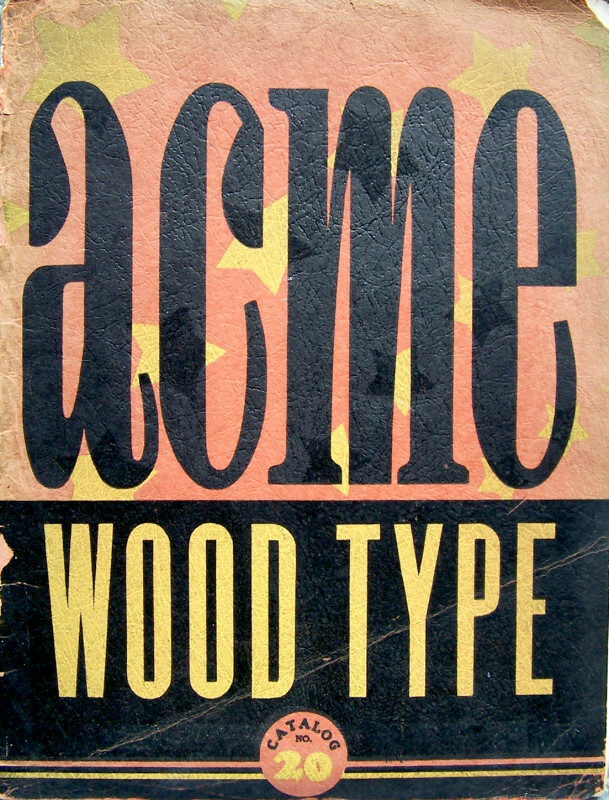 Most references to ACME lead to information concerning the ACME Type Foundry based in Chicago—further study indicated there was no direct connection between the Chicago foundry and the New York wood type manufacturer. The first reference to the manufacturer I was able to uncover was in a 1944 issue of Book Production2. 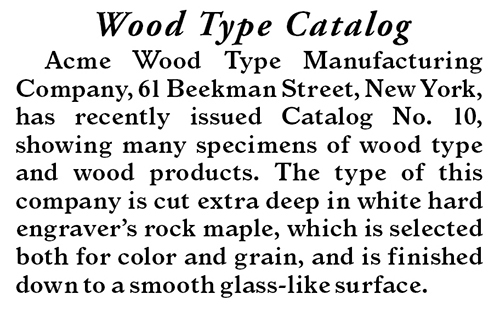 A short entry about a new binding product that the American Wood Type Mfg Co was bringing to market, included a passing remark about how the ACME Wood Type & Manufacturing Co had been absorbed by American Wood Type Mfg Co in the early 1940s. The ACME Wood Type & Manufacturing Co is also listed in the 1938 Catalog of Copyright Entries3 for the printed broadside “Now! Dress up your cards and posters” © Dec 1, 1938. There is no known existing copy of this broadside. A 1937 American Printer and Lithographer4 has a short paragraph about ACME which includes a description of the wood type specimen catalog, “More than 200 large display lines are shown in the book, ranging from 48 point to 36 picas in size, and include new wood type designs, together with conventional gothic. Several pages are devoted exclusively to various figures in different sizes. 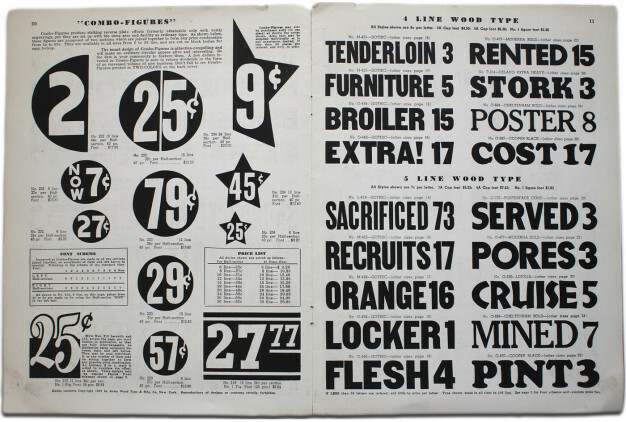 The book is 9⅛ × 12½ inches, and has 32 pages.” It goes on to describe some of the content: “Three new copyrighted novelty designs in wood type are shown in the new specimen book of the Acme Wood Type and Manufacturing Co. 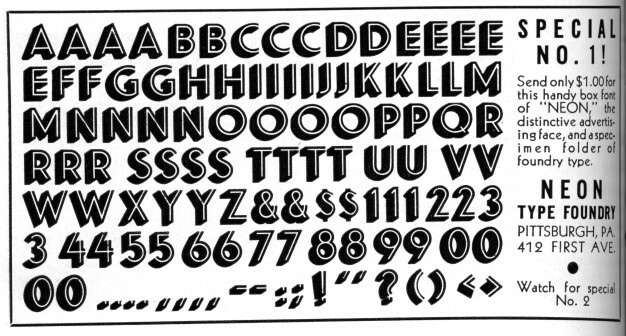 These are ‘Combo-figures,’ ‘Link-a-types’ and ‘Pep-a-cuts.’” This clearly indicates that there was a specimen book of Acme wood type available in the late 1930s. Further research indicated this catalog was first published March 10, 19375. During the winter of 2012, I visited the American Printing Equipment & Supply Co6, at the invitation of Greg Mandel the owner and president of the company—and the grandson of Rube Mandel the founder of American Wood Type Mfg Co. While looking through the collection of specimen catalogs held in the corporate offices of American Printing Equipment, I came across a copy of the illusive 1937 ACME catalog. The cover indicates ACME published this specimen book as Catalog No. 20,—it is unclear if this number indicates that this is the twentieth catalog produced by ACME or if this number has some other obfuscated significance. The catalog has a 3-color cover with interior printed in black on off-white uncoated stock. It is 32 saddle-stitched pages plus cover and measures 9⅛ × 12½ inches. It includes 27 different type designs, all typical mid-century offerings predominantly made up of Gothics but also a selection of Slab Serifs and Brush Scripts as well as borders, simple geometric ornaments and calendar sets. It includes sizes from 4-line to 36-line. It indicates that sizes up to 100-line can be cut to order and that they cut all type on end-wood up to 50-line7. This is the only know copy of this specimen catalog, though a copy appeared on an ebay auction in the spring of 2013, the whereabouts of that particular copy of the catalog is currently unknown. One interesting detail of the catalog is a line of text on the first page that reads “[o]urs is the only wood type which is marked at the bottom, corresponding to the ‘nick’ in metal types, to prevent setting letters upside down.” I have come across wood type with this bottom ‘nick’ and always assumed it was more than likely an “after-market” alteration performed by the printer. This text confirms the practice was actually carried out by the manufacturer, and can be used as another tool to help identify type of unknown origin. The earliest reference to ACME is in the December, 19338 issue of The Graphics Arts Monthly. There is no known copy of ACME’s Catalog No 10. Like Catalog No 20 it is unclear if the catalog numbering has any substantial meaning. In the April, 1939 issue of The Graphics Arts Monthly9 an advertisement was published with details of a licensing agreement between ACME and the Neon Type Foundry. ACME “announces that, by special arrangement with the Neon Type Foundry, Pittsburgh, Pa., it is now producing…the style of type known as ‘Neon.’ This type has heretofore been available in metal type only in sizes up to 54 point; but now will be available in wood type through the Acme company. The firm is preparing a brochure, for those interested, showing the face in various sizes.” This advertisement is useful in two ways. 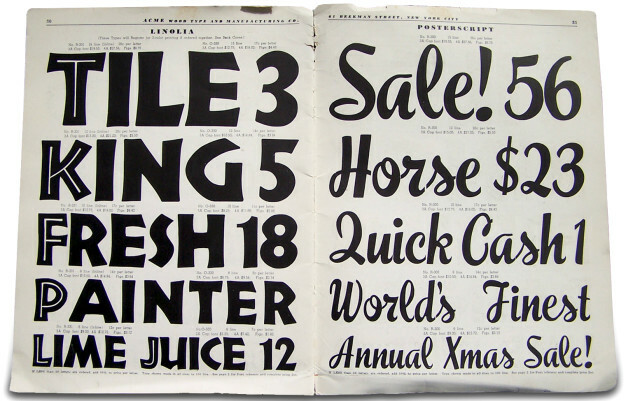 Because of the confirmed publishing date of the advertisement, it first, clearly establishes when Neon was first cut as a wood type and second, indicates that a brochure was produced showing the new wood face. A copy of this brochure has yet to be found in any archive. Beyond knowing that ACME was in business from at least the early 1930s till the early 1940s, operated for a time at 61 Beekman Street, New York City and that they had sales agents in Chicago and San Fransisco, more information is needed to establish when ACME started manufacturing wood type, when and where it was founded, any business officers that ran the company and any other specimen catalogs published showing the wood type they produced.